Home IoT Development Services How is Advanced App Development Revolutionizing the IoT World? In today’s technology-driven world where almost everything can be handled by over a mobile app, it is no more a matter of luxury but a necessity. Mobile apps make the most time-consuming task easy which can be operated with a few taps and you are through it. The introduction of mobile apps has redefined the marketing strategies and the future technology like IoT, Artificial Intelligence, and Augmented Reality. The contribution of mobile apps has been tremendous in revolutionizing the technology world. IoT meaning “Internet of Things” empowers a machine to be it TV, fridge, AC and any gadget you can think of, to function as per your requirement and the sensors can send and receive data in a matter of no time. To make this technology a mainstream, cloud computing, mobile technology and wireless technology have made an enormous contribution. Mobile apps have changed the whole perception of how communication used to happen, mobile apps have changed the way how businesses used to interact. The way mobile apps are being perceived in today’s era, no wonder IoT will evolve at jet speed. Since we can already see the concept of smart is being embraced like smart city, an intelligent home, and smart office, smart stations are coming up. Similarly, the evolution of smartphones and wearable devices such as a smartwatch, smart glass, and intelligent belts will continue to evolve, and mobile apps will be the essential mode which will be able to interact with the internet of things enabled devices. As mobile devices are already built with apps and sensors which are capable of revealing the sensitive data about the users, the geolocation feature enables one to trace the light condition, the functioning of the device and much more. The mobile devices are very compatible and offer multiple connectivity options such as Bluetooth, WIFI which allows easy data are transferring and seamless communication. 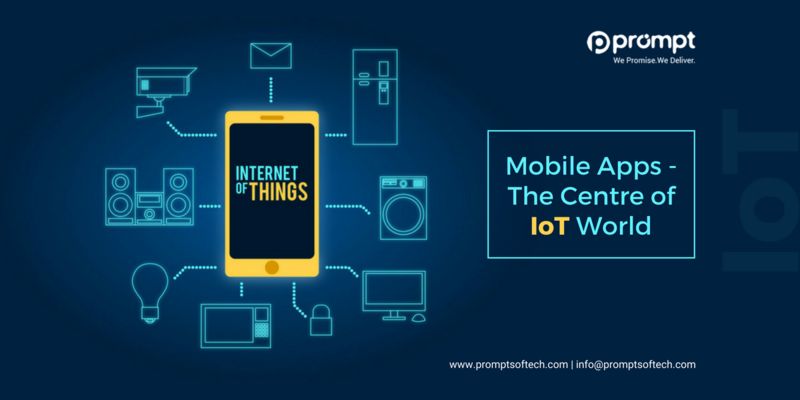 Hence, these features of mobile devices make it the most important invention and a considerable contribution to elevate the advancement of IoT world. Today, you can integrate your smartwatch, smart glass or fitness band with your mobile device which gives various other features and functionalities to enhance the user experience. You will find leading five-star hotels have already replaced the keys and cards with smart apps, where users can access their room simple with a mobile app. This replaces the fear of losing the keys or card. Just a smartphone and the hotel app is enough to access your room. Even offices have embraced IoT, as you can see IoT enabled offices can access and operate systems remotely. Mobile’s wireless connectivity and inbuilt sensors strengthen the offerings of IoT system. IoT has a long way to go by leveraging the mobility and the apps, and there is a potential of creating a world full of opportunities in various sectors such as education, transportation, retail, healthcare and more. The time is not far when the mobile phones will be the primary interface to access the IoT based system, hence virtually obtaining these things will be comfortable and convenient. By the year 2020 over 50 billion devices connected to the IoT s comfortable and convenient. By the year 2020 over 50 billion devices connected to the IoT system. The innovations in the IoT world will make our lives easy and convenient. E.g. The travel industry was transformed by Uber, where they smartly leveraged the mobile phone and offered convenience through mobile apps. The IoT based business model is a great success and has set a great example. They have truly revolutionized the way people travel. As IoT has already taken over this era, we are already living in smart homes, where the security of your home can be managed just with a mobile app. Hence transferring the data will also be easy and the information transmitted through the device will be on a real-time basis. We highly recommend when IoT App Development Companies and business join hands to come up with more and more mobile applications. Great mobile apps which allow physical objects to sync to the objects seamlessly will surely add significant value to our lives and transform the way we live our day to day lives. Presently both iOS and Android devices both are offering a brilliant platform so that businesses can hire IoT Development Services from companies providing such services. Though IoT is a new invention and gradually catching the pace, there is no second thought that it has a lot to offer to the world and transform our lives. Continuously there are a lot of IoT application development companies who are embracing the trend. There is also a sudden increase in the number of mobile applications which are compatible with the IOT based system. Since mobile apps help us to connect with the world, its constant contribution to the IoT world will make the world a better place. As we are already experiencing smart gates at the airport, quick check-ins, and all the possible things one can think of, we look forward to the evolving IoT ecosystem in the coming years. Prompt Softech is an Internet of Things (IoT) application development company headquartered in India with both local and global clients. We offer IoT solutions and services infusing industry-specific technology and security fulfillment standards. We enable deployment to production and also provide accurate automated testing. We leverage the open-source technologies to develop cloud-native apps and building fault-tolerant web and mobile applications with enhanced performance levels. Our custom developed projects give a competitive edge to our clients as we use most modern software and devices. We create UX based designs along with action-driven application workflows for our projects. What do you think about the mobile apps contribution in the present IoT system; do write to us in the comment section, we will be happy to discuss the future possibilities!